Capcom's remake of Resident Evil 2 is a pretty difficult game. 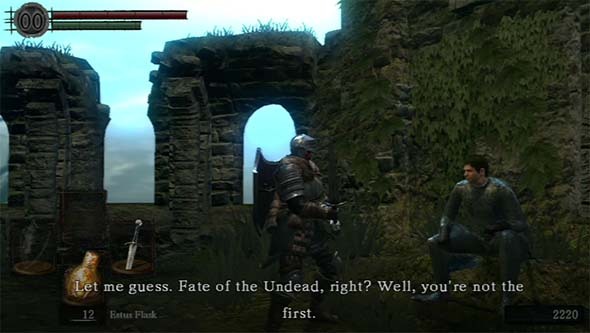 Much of its design is based on classic survival horror paradigms, which many players may not be familiar with. Classic survival horror has been essentially dead since the release of Resident Evil 4 all the way back in 2005. (And if you want to know what I think of Resident Evil 4, you can listen to my commentary in a playthrough for On the Branch's Let's Play channel). 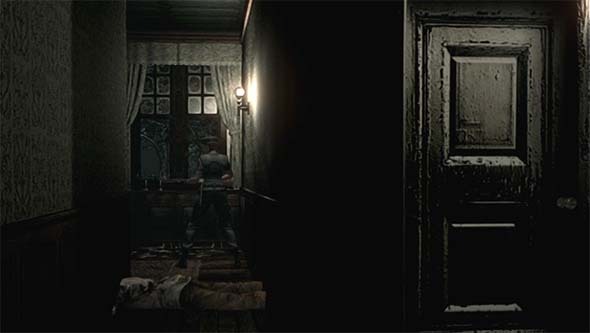 Since then, every mainstream horror game has either followed a formula similar to RE4 (such as Dead Space and The Evil Within), or it has gone the Amnesia route and been about running and hiding from foes rather than confronting them (such as Outlast and Silent Hill: Shattered Memories). If you didn't play Resident Evil 7 or the REmake of the first Resident Evil, then you probably haven't played a true survival horror game in over 10 years (if ever). 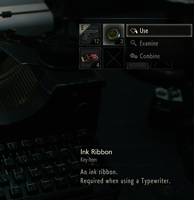 Even though it has an over-the-back, third-person camera, Resident Evil 2's remake firmly follows most of the design conventions of the classic (pre-Resident Evil 4) survival horror genre -- minus the tank controls. 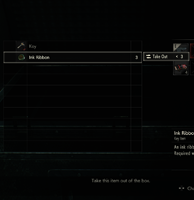 Here's some observations of mine that I hope will help you survive Raccoon City, whether you're an experienced survival horror gamer (like me) or a newbie. Don't break or lose your knife! You will be back-tracking a lot! Resident Evil is a REmake done right! Not having a GameCube meant that I unfortunately missed out on some pretty high-quality games. Probably the most notable ones were Eternal Darkness and the remake of Resident Evil, neither of which, by itself, was enough to sell me on a console. I've since been able to play through a friend's copy of Eternal Darkness, and I had started on Resident Evil, but never got around to finishing it. 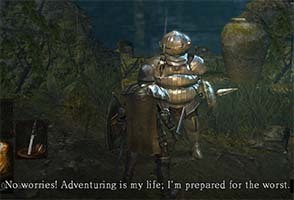 When the HD remaster showed up on PSN, I was hesitant to buy it, since I knew that I could just play it on my friend's GameCube eventually. However, something in the previews really intrigued me. And that was the compromise that Capcom found for the never-ending conflict between the tank-style controls of the original PSX game and the analog control of newer games. Since I grew up with Resident Evil, Silent Hill, and other survival horror and similar adventure games, I've never had a problem with tank controls. 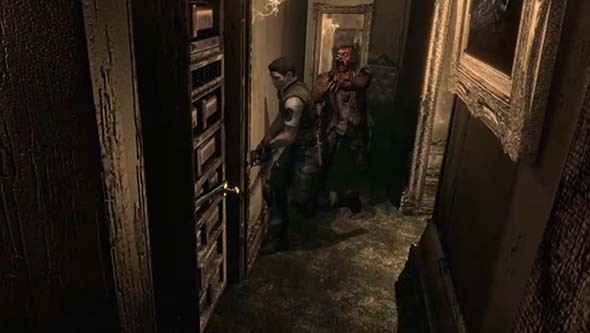 They tend to be the lesser evil when dealing with static camera angles that change unpredictably (as in Resident Evil), and they are perfectly serviceable for behind-the-back or overhead cameras (as in the outdoor areas of Silent Hill). 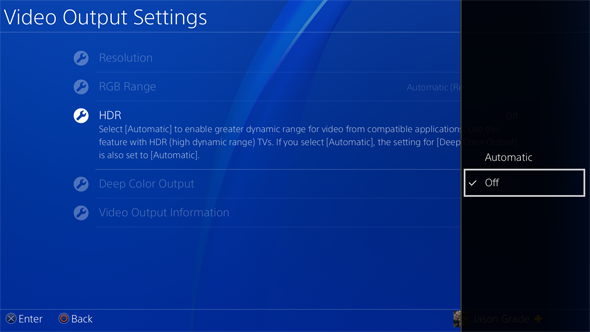 This ensures that the controls remain consistent during camera angle changes, since they are always relevant to the character rather than the camera. Regardless, analog control has its own baggage train of problems. 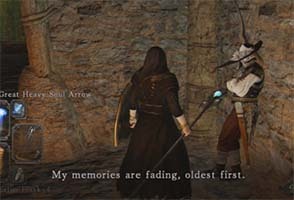 Pressing the stick in one direction can cause the character to make sudden changes of direction if the camera suddenly changes. This can be mostly avoided by locking the character's movement as long as the player doesn't release or rotate the stick - and the HD Remaster does implement this. But this still leads to sudden turn-arounds when the player needs to move the character around a corner, since you sometimes have to move the stick to the exact opposite direction that you were pressing. And in cases in which the camera angle changes at the point where a change of direction is required to go around a corner or navigate an obstacle (which happens often), then the character can easily get lost in a cycle of spinning around between the two camera zones. So there is no perfect solution to the problem of static cameras, but I tend to prefer the tank method due to its guarantee of consistency - even at the cost of some slow turning speeds. In any case, advocates of either paradigm should find exactly what they want in this remaster, since both configurations are implemented in the remastered game's default control scheme! Capcom's clever (and elegant) solution was to simply map the tank controls to the directional pad, while leaving the free analog movement on the analog stick. Players are, thus, free to alternate between whichever control they prefer without even having to go into a menu to change it. You can even alternate between them, on the fly, in the heat of the action if the situation warrants it, because I can definitely see how the analog movement could work well in some of the [rare] larger, open areas of the map (particularly for boss fights). Most of the changes introduced in the GameCube remake serve to add further challenge. The most prominent display of this is the new "Crimson Head" zombie mechanic. If you kill a zombie and didn't manage to get lucky enough to blow its head off, you must burn its body in order to prevent it from resurrecting later in the game as a more dangerous "Crimson Head". These red-headed zombies are faster and more damaging than their precursor form. They can rapidly run across a room and grab you before you even realize they are there. 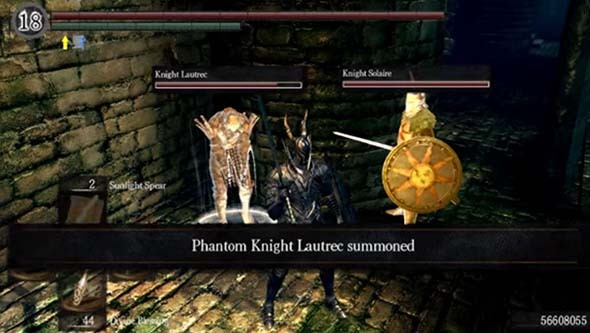 They are also very well-tutorialized, since most players will probably encounter their first Crimson Head while attempting to retrieve the Armor Key from the hallway trapped with suits of armor on rails. The previous hallway includes a dead body that (if you didn't go out of your way to burn previously) will resurrect at this time. This hall has a system of mirrors in place that allow a tremendous degree of visibility from virtually every camera angle, meaning that whichever door you enter from, you'll have an opportunity to see the Crimson Head coming after you. It's a frantic and frightening moment! Bodies that you don't burn will resurrect as faster, more deadly "Crimson Heads"
that are difficult to avoid and require a second investment in resources to defeat. Are you as sick of zombies as I am? They're everywhere. Perhaps the real zombie apocalypse won't be caused by radiation or a genetically-engineered plague; it will be caused by media corporations drowning our brains in zombie entertainment until we all go crazy and start eating each other. Wait, I thought the zombies were supposed to be the bad guys?! OK, sure, the creatures in Naughty Dog's latest adventure game, The Last of Us, aren't actually "zombies", they are humans infected with a fictionalized variation of Ophiocordyceps Unilateralis. But they're functionally the same thing. The "infected", as they are known as in the game, are mindless, mutated monsters that shamble around and eat any human they become aware of. And if they bite you, you become infected and the fungus takes over your brain, turns your flesh into spore-producing tendrils, and makes you a cannibal. 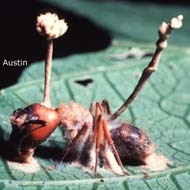 [LEFT] An ant infected with cordyceps. 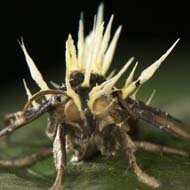 [CENTER] A moth infected with cordyceps. [RIGHT] A human infected with cordyceps, as depicted in The Last of Us. The game takes place 20 years after the sudden outbreak of the human cordyceps infection that leads to the death of the protagonist's daughter. 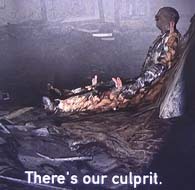 Society has collapsed into ruin, with the surviving 40% of people (including the protagonist, Joel) concentrated in quarantined ghettos in the remains of major cities. Joel is working as a smuggler, bringing food, weapons, and supplies into the Boston quarantine zone to be sold on the black market, and he is tasked with escorting a young girl, named Ellie, to a research lab out west. 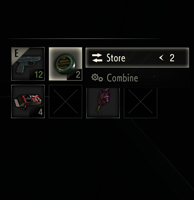 Ellie is unique in that she seems to be immune to the cordyceps infection. She was bitten weeks ago, and has suffered nothing more than some ugly skin lesions near the bite; whereas, everyone else begins to turn into a zombie within hours of being infected. This, of course, makes her survival paramount, and Joel must do whatever it takes to ensure her safe arrival at the lab so that the researchers can hopefully study her to find a cure or vaccine.